A ggplot2 geom tells the plot how you want to display your data in R. For example, you use geom_bar() to make a bar chart. In ggplot2, you can use a variety of predefined geoms to make standard types of plot. 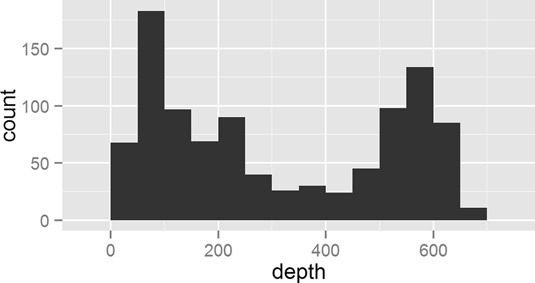 A geom defines the layout of a ggplot2 layer. For example, you can use geoms to create bar charts, scatterplots, and line diagrams (as well as a variety of other plots), as you can see below. Each geom has a default stat, and each stat has a default geom. In practice, you have to specify only one of these. To make a bar chart, you use the geom_bar() function. However, note that the default stat is stat_bin(), which is used to cut your data into bins. Thus, the default behavior of geom_bar() is to create a histogram. Notice that your mapping defines only the x-axis variable (in this case, quakes$depth). A useful argument to geom_bar() is binwidth, which controls the size of the bins that your data is cut into. This creates this plot. Making a histogram with geom_bar(). So, if geom_bar() makes a histogram by default, how do you make a bar chart? The answer is that you first have to aggregate your data, and then specify the argument stat=“identity” in your call to geom_bar(). In summary, you can use geom_bar() to create a histogram and let ggplot2 summarize your data, or you can summarize your data and then use stat=“identity” to plot a bar chart. To create a scatterplot, you use the geom_point() function. 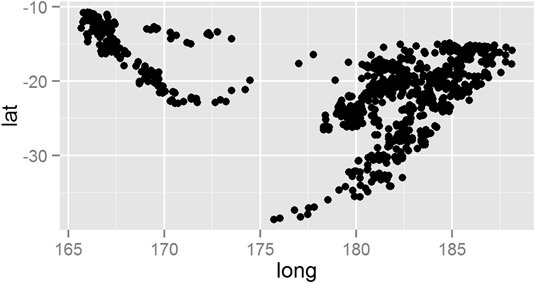 A scatterplot creates points (or sometimes bubbles or other symbols) on your chart. Each point corresponds to an observation in your data. You’ve probably seen or created this type of graphic a million times, so you already know that scatterplots use the Cartesian coordinate system, where one variable is mapped to the x-axis and a second variable is mapped to the y-axis. Making a scatterplot with geom_point(). To create a line chart, you use the geom_line() function. You use this function in a very similar way to geom_point(); the difference is that geom_line() draws a line between consecutive points in your data. Drawing a line chart with geom_line(). You can use either geom_line() or geom_path() to create a line drawing in ggplot2. The difference is that geom_line() first orders the observations according to x-value, whereas geom_path() draws the observations in the order found in the data.